The very first time a yoga teacher told to me to lean forward against a wall to do a modified down dog (wall dog), I was petrified. My lower back, my discs, do not like sustained flexion. If you are in Orange County Calif: Orange County Foundation Training Face Book Page. The yoga teacher showed me that the goal was to lengthen the spine and keep it in neutral. Once I got over my fear, the modified down dog became a mainstay of my disc exercise routines. I am reminded of this because foundation training uses a “braced spine” position as a way to strengthen and tone the back extensors, in concert with activating the whole posterior chain. Eric Goodman, the chiropractor / trainer who developed this routine, defines the core as any muscle with a direct connection to the pelvis, from below as well as from above. 2nd video 5ish min: Foundation Training: What is all the hype about!? When I first saw these exercises, I was a bit skeptical. I have a broad variety of exercises I teach my patients based on symptoms and the results of functional tests. Could a single exercise system work for multiple low back problems? After using it and teaching my patients this model for a couple of months, I am convinced this approach is powerful and effective. What do I like? The first two movements of the “founder” exercise. Reproduced with permission from Eric Goodman, DC. The exercises feel like real exercise. You feel the burn; you know you are working. Some motor-control exercises from other traditions are just too subtle. This has depth and subtlety, but it is within a context of exercises that are relatively straightforward and physically challenging. The integration of activating the hamstrings, adductors and gluteals, along with the back extensors, is profound. I have come to appreciate that many of the tight muscles we used to just stretch actually improve in their function much better if we strengthen them, ideally with strengthening in length and/or functional positions. In foundation training, the emphasis is on strengthening the adductors and the hamstrings in a lengthened position. The patient and the doctor/therapist/trainer get immediate feedback. When you are doing these exercises, you can feel where you are weak. After you do the exercises, your posture and function immediately improve. It is safe. The emphasis on maintaining a neutral spine keeps the lower back from getting injured. These exercises are clearly from the yoga tradition. The older style of yoga that I learned 30-40 years ago seemed to emphasize strictly relaxation and stretching. The newer forms of yoga, at least the ones I appreciate, emphasize co-contraction, activating the muscles as you lengthen them. The best yoga, in my opinion, does not just go for extreme positioning at the end range. I don’t think you should sacrifice any joints in the name of some theoretical ideal end-range position. Foundation training is clearly in the newer style of yoga tradition. “[This training] to me represents modern-day yoga, exercises adapted to our current lifestyle where we sit at computers, drive in cars and predominantly lead sedentary lives … [The] postures resemble yoga positions and when I first saw the pictures of the exercises I incorrectly assumed these were modified yoga postures and that there was nothing new, just a reinvention of an ancient tradition. Within my first 60 seconds of my [session], I realized how wrong I was. These subtle variations in positioning that form the basis of the work completely alter the dynamics of the exercises and force the body to adapt, to use muscles we leave dormant, strengthening the body in just the areas of weakness that modern life generates. Enough talk; let’s make it practical. I’ve included pictures of the essential first two movements in this article. The key is to start with a hip hinge. I was surprised to see how few of my patients, even after I had trained them in my previous rehab models, really understood this motion. From the hip hinge, with the knees unlocked, bring your straight arms behind you with the thumbs pointing outward. Isometrically bring your legs together and keep your weight back on your heels, activating the hamstrings, glutes, and adductors. Now bring the arms forward, keeping the braced spine position as your spine goes forward. The key is the details. You have to start with the hip hinge; this is a challenge for most lower back patients. The legs are active and isometric, pulling together but not pronating the feet. 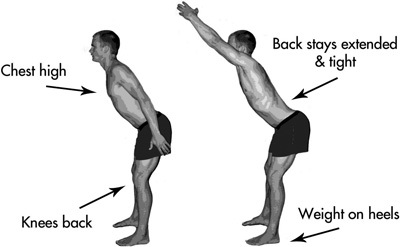 Maintain the lumbar lordosis actively as you brace forward. This is a brief synopsis. Watch the videos for the full routine and to review other exercises. There is depth here; you are not going to fully get it unless you learn more and just do the exercises yourself. I think you will love this. I think even those of us who are not rehab geeks will find it very useful for a majority of our back pain patients. Personal communication; used with permission from Daniel Kalish, DC. Goodman E, Park P. Foundation: Redefine Your Core, Conquer Back Pain, and Move With Confidence. Rodale Press, 2011. Goodman E. YouTube video on foundation training.